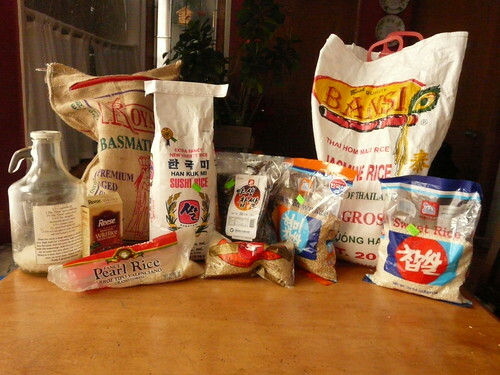 Last winter I woke up one morning and decided to catalog my rice. This probably doesn’t sound like a very entertaining way to spend a Saturday morning, but I’m hoping the resulting photos will be useful for this blog. 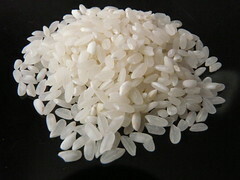 Rice, of course, is a primary staple in many areas of the world. It’s cheap, it’s healthy, and it’s easy to start cooking (especially with a $20 rice cooker from Target). Since I have access to many fun cookbooks and great grocery stores all over Chicago, I’ve had fun learning more about rice and the many ways it has been adapted to suit various cuisines through many different textures and flavors. As I post recipes that call for a specific type of rice, I will be linking back to this post and adding more photos and background information as I continue to learn more about this key ingredient. 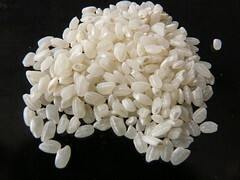 Arborio is a short-grained rice used in risotto and sometimes paella. Both are cooked very slowly with small additions of liquid to create a creamy richness to the rice, usually infused with broth or cream or both. Paella is often more of a stew with seafood or chorizo sausage or other additions. With a longer, dryer kind of rice, the slow constant stirring would break it all to pieces and create a pan of mush with no definition. Where I live Arborio is much harder to find than other varieties of rice, and is always more expensive too. It isn’t one I’d ever use on its own for plain rice. I don’t make risotto or paella very often because they’re so time consuming to cook, but both can be very nice in the winter. My best local source for Arborio rice is Family Fruit Market on 4118 North Cicero Avenue, where I can get a bag of imported Arborio rice from Italy for $4-5 for a ~2lb. bag, which usually makes 2-3 dishes. 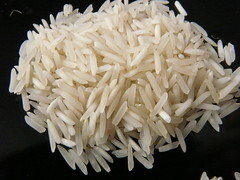 Basmati Rice is used in Persian and Indian cuisine, spiced and carefully cooked for pilaf, pilau and biriyanis or plain as a simple accompaniment to curries and other dishes. 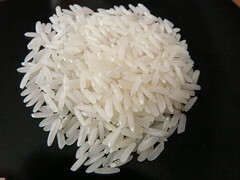 Unlike the rices of Korea and Japan, Basmati is a long-grained rice that is carefully aged to bring out its fragrant aroma. This process should create a very long firm grains with a, fluffy “dryness” to the dish when they are properly cooked. Basmati rice should never be cooked into a mushy pudding. To make sure it cooks up as a relatively moist dish but isn’t sticky, it helps to soak it for about half an hour in cold water before cooking it. Rinsing it is also a valuable step if you aren’t sure how it’s been processed and want to wash away extra starch. I’m not enough of a connoisseur of Indian cuisine to distinguish between different brands of Basmati, so I usually try different brands or see what’s on sale when I get up to the grocery stores in “Little India” on Devon and Western here in Chicago. I try to avoid buying Basmati anywhere else – it ends up being ridiculously expensive or is some sort of American knock-off that doesn’t have the right flavor and aroma at all. Jasmine is, like Basmati, a long-grain rice that is aged to produce an intense aroma. The flavor is a bit sweeter and less “nutty” than Basmati and the grains are a little stickier, better suited for eating with chopsticks. It’s probably best known for its association with Thai food, but is common to other Southeast Asian cuisines as well. Its aroma makes it a great accompaniment to many coconut curries and other spicier dishes with lots of gravy, but leftovers also make for great fried rice. The trick for fried rice is to make it with leftovers, preferably a bit dried out after being refrigerated. Stir-frying hot, moist rice just makes for a messy mush. I sometimes am able to pick up Thai ingredients at the Southeast Asian markets along Argyle street in Uptown, but that’s a bit of a treck from our house so I often end up buying Jasmine rice at other Asian markets, either along Devon or at the Korean market near our house, where I’m also able to buy cheap coconut milk and other Thai ingredients. Rice is an essential ingredient in Korean cuisine, but unlike Basmati and Jasmine rice, it is prized for its fresh flavor and is intended to have a stickier texture and shorter grain. It can be served plain as a simple base for a meal, stewed into porridge with other ingredients, mixed with beans, seaweeed, or other grains as a hearty side dish, or seasoned with dressings and shaped into sushi-like snacks and rolls. Many Korean dishes have very simple names that are easy to understand once you learn a few basic terms – “bap” or “bop” is rice, and “kim” is the seasoned seaweed/laver sheets. So “kimbap” is simply seaweed wrapped rice. “Bibimbap” is a common dish made fresh or with leftovers that simply means “mixed with rice”. I pick up all of my Korean groceries at Joong Boo Market near Belmont and Kimball, formerly known as “Chicago Food Corporation”. It’s a lovely store and entirely too inspiring – I have to watch how often I go there because I tend to buy all kinds of fun snacks or frozen foods whenever we stop by. I’ll add more varieties of rice later, as I find more to say about them – I’m fond enough of the texture of the ones I’ve mentioned so far that I rarely cook with American rice anymore unless I’m going to be heavily seasoning it in a way that would mask the aroma and texture of the rices listed above. Here are a few examples of rice dishes I’ve cooked and photographed. If you have any favorite rice dishes you’d like me to post recipes for, let me know in the comments.